(From top left) I finished the 10th Alex Rider book this week- quite childish but I loved it none the less. On Saturday morning I decided to clean the car on a bit of a whim. I made delicious jaffa cake cupcakes with LOADS of icing- you can see the finished cupcakes here. Mum and I made a pudding with flaky pastry, marzipan and chocolate for Sunday dinner. Saturdays dinner was imam baildi- stuffed aubergines. Sleepy selfie when Scott left at mid-night. It seems several weeks since I went to Aberdeen last weekend- I don't know why it feels so long ago. 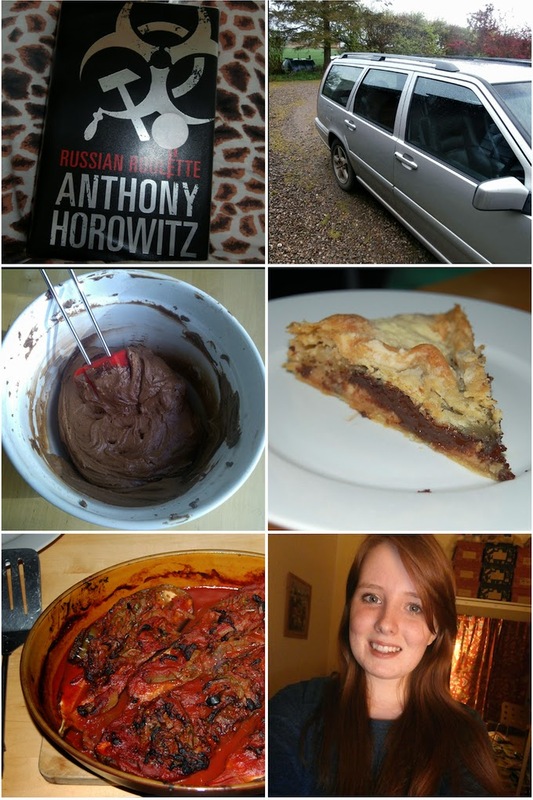 As you can see from the pictures so I've not been doing much this week that's why it is mostly food in my pictures. During the week I didn't do much but housework and university revision. Tuesday I was sufficiently bored I decided to do some baking so I choose the first recipe in the hummingbird bakery book- jaffa cake cupcakes and they were amazing. On Wednesday I went to see my boyfriend after he got back from Tenerife the day before. It was beyond lovely to get cuddles again- a week seemed like along time. On Saturday morning I decided to clean the car for no real reason- it was just annoying me it was so dirty. It took me a good few hours and when I got back inside I was very cold. That is enough excuse for me to have a long hot bath. The weekend was slightly boring actually- its not like me to be bored. On Sunday afternoon Scott came round just to chill and mum invited him for dinner. We looked through films to watch but we couldn't really see anything we wanted so we took the dogs for a walk and didn't do much else. He didn't leave until midnight so I had to make mums birthday card after that (it is on Monday). Hence why this post is so late- I didn't get to sleep until about 2am. Hope everyone had a good weekend- I'm sure I will get the motivation to blog again this week. Oh, I have this wee aim of reaching 300 followers on BL by my 200th post (about the 18th of may). So if you stop by my space of the Internet regularly then please give me a follow here. Jaffa cake cupcakes sound amazing! Your week in food looks amazing! I really want everything you've pictures. Jaffa cake cupcakes sounds to die for, orange flavour is my favourite flavour to go with chocolate ever!